The Generations Black LGBTQQ History Event is a free annual community event which celebrates the lives of Black LGBTIQQ People. The committee is chaired by Micah Lubensky and Brandon Ivory. The planning committee is staffed by several Black LGBT community leaders throughout the San Francisco Bay Area. These leaders volunteer their time to produce this important event. The Generations Planning Committee highly encourages Trans, Lesbian and LGBTQQ youth come out for 2017 event. It’s going to be a lot of fun! Each year participation in the celebration has increased. This year will be no exception. 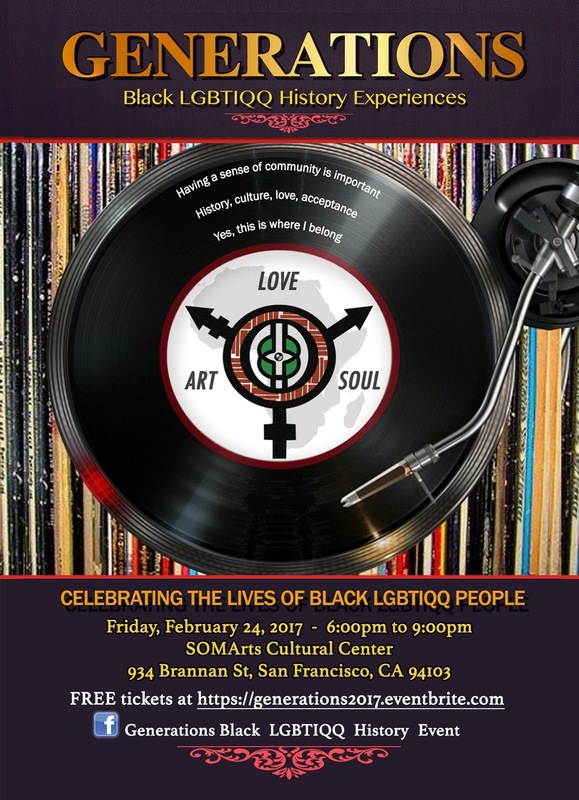 The Generations Black LGBTQQ History Event host its celebration in San Francisco. Generations original venue was at the African American Arts and Culture Complex in the Western Addition. Last year, the event moved to its current venue at the SOMAArts Cultural Center. Generations started in 2010 as a pilot event for Black Brothers Esteem (BBE). This original program was organized for program participants of BBE. However, it was so successful that in 2011, Micah Lubensky, in collaboration with local African American HIV/STD service providers organized the first official Generations Black LGBT History Event. The Generations event offers an entertainment and educational program that includes a reading of biographies of Black and African-Diasporic leaders, an art gallery, free food, live music and free HIV/STD Testing. Black Brothers Esteem, (a program the San Francisco Aids Foundation) offers a variety of activities to promote the sexual health and well-being among Black Gay and Bi-Sexual men and Transgender individuals. In 2016, BBE celebrated its 20th year of operation in service to the Black African-Diasporic community of San Francisco. The 2017 event poster contains quotes from the previous year’s program participants: “Having a sense of community is important”, “History, culture, love, acceptance” and “Yes, this is where I belong” proudly mark the cover. The Generations Black History LGBT Event organizing committee is currently offering leadership opportunities. The focus is to attract Trans leaders, women and youth participation to organize a more well-rounded event. The organizing committee of Generations prepares for several months, starting in July, to produce this event during Black History Month. This one of a kind activity recognizes the significant contributions of Black LGBTQQ community leadership. Every year, the event honors awardees in three in three vital categories. New Comer Award – for someone that has done something significant to support the Black African-Diasporic LGBTQQ community over the last 5 years. Lifetime Achievement Award – for someone that has been that has done something significant to support the Black African-Diasporic LGBTQQ community for the last 10 years. Community Organization Award – An organization that supports the Black African-Diasporic LGBTQQ community. There is an evaluation team that is comprised of leaders from our community. The information is used to report back to funders and organizations and other people around the world. Micah and Brandon have given presentations about the success of this event at both national and international conferences. In 2014 they presented at the NAESM conference which focuses on HIV and other health disparities. In 2016, they presented at the international AIDS conference in the Global Village at the MSN networking zone. Micah and Brandon shared the impacts of the generations project over time, what was documented though the surveys and feedback from the event evaluations. Micah says, “African-Diaspora folks from the continent of Africa, the Caribbean and Europe were in attendance and Black LGBTQQ folks from the states began hearing about this vital work and were inspired”. I have been on the organizing committee for three years supporting our promotional efforts via social media and throughout the San Francisco Bay Area Black LGBT community. We have been focused on engaging our trans community, woman, youth, various LGBT night life venues and organizations such as; Larkin Street Youth Services, Project Open Hand, Glide Memorial Church , Shanti Project and GLBT Historical Society . I advocated for and implemented a voter registration drive during the event. Last year, we engaged over 50 guests. We also provide the opportunity for guests to engage with local Black LGBT leadership organizations. Generations leadership envisions with sufficient funding that the committee will eventually staff someone to support production activities. Michah and Brandon say, “if we could pay someone to produce this event that would be wonderful”. The event welcomes donations, in-kind donations and volunteers but is not currently funded by grants. For questions or to financially support the continual growth of the Generations Black LGBTQQ Event contact Brandon Ivory.